So, you're on that long hike that we call life. You're climbing that hill. You're on your way up. Here's the thing, sometimes you just need a shortcut to become the old soul you just know is inside somewhere. Old folks simply get away with things that us spring chickens can't. For instance, Argyle might not be part of your day-to-day wardrobe right now but maybe in a couple decades, you'll find that it simply looks natural. You'll find yourself sitting on a park bench reading a newspaper, wearing a newsie cap with highwater slacks and argyle socks and somewhere a young kid will be looking you up and down wondering why he can't get away with dressing like that. Just wait and see young fella! 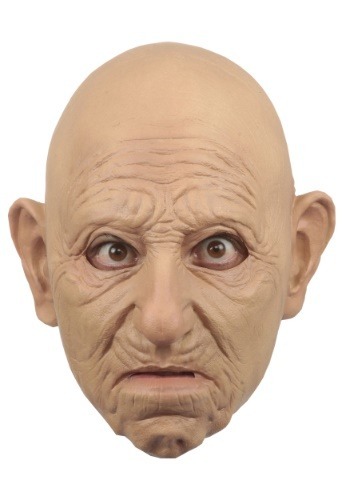 Or, he could take the aforementioned shortcut over the hill with this old man mask. So could you, now that we think of it! You'll feel right at home yelling, "Get off my lawn!" when you show up in this old man mask at your next costume party. It's realistic, flexible, and might even allow you to get away with wearing Argyle like never before. You might not get the wisdom that comes from hiking over the hill all those years but you just might fool a few people! You might be young only once but with this mask, you can be old as many times as you want! Sure, it works great on Halloween but don't stop there! Bring it out when you're FaceTiming your friends to explain why you don't want to go clubbing. Bond with your Grandpa by griping about the new-fangled jukebox at the Eagles Club. The sky is the limit. . . as long as dinner is served by four-thirty.